*Price includes: Classroom Instruction, all 12 lessons, observation, parent class and Driver's Ed certificate fee. We understand it is tough to come up with the full cost of our program at one time. We make it easy to spread out the cost. We only ask you to pay as you take our services here. For example: First day of class the $100 is due for the course, then for the driving portion just bring $50 the day of the lesson**! **$60 for commercial lessons not taken with the full program. We have a wide variety of class times availible. We offer one week, evening, and Saturday courses at our Townsend location. At our Nashoba Valley Tech course and Sizer School, we offer afternoon courses twice a week. Summer courses are offered every other week. Call our office for the latest scheduled class openings! $100 Deposit due on first class. $150 assessed if classroom completion letter is issued without taking the 12 hours in car driving lessons. We offer lessons on a first come-first serve basis. We have several skilled instructors serving the area at all times of the day. 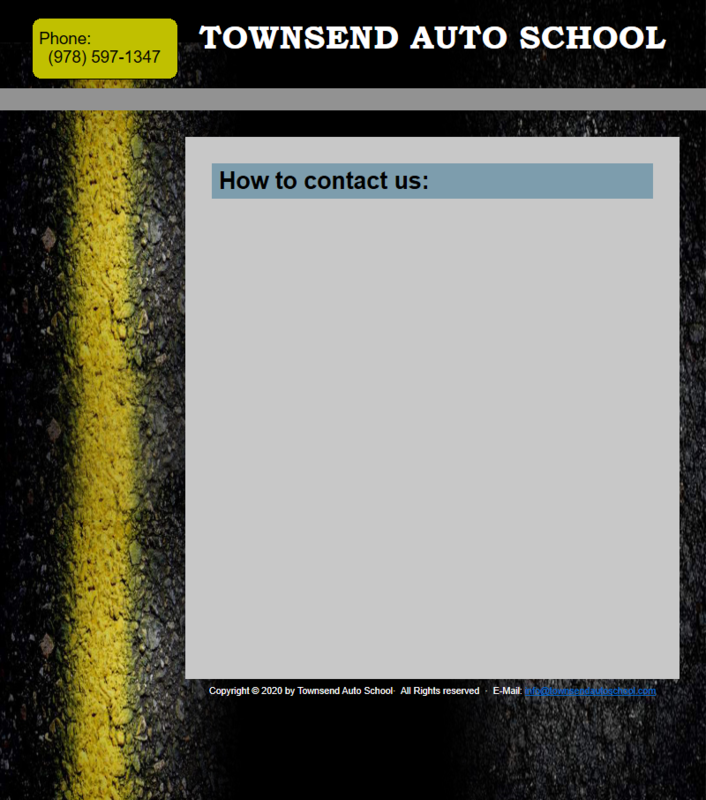 All of our instructors are Licensed, Insured, and recognized by the RMV. All of our staff receive CORI checks annually. a sponsor for the test, then pass or fail get you back home. $50 package: We will meet you at the RMV, provide a car for the test, and provide a sponsor. Student must find their own ride home. must provide ride to and from the RMV. We are pleased to annouce that we will be hosting ROAD EXAMS at the Leominster RMV on weekends and some evenings. These are fully sanctioned by the RMV and will be made available on certain weekends and weekday evenings! Call our office for more information! *ADD A WEEKEND ROAD TEST TO YOUR "FULL PROGRAM" FOR A DISCOUNTED PRICE OF ONLY $75!! *Save $25! **ADD A REFRESHER LESSON TO A "FULL PROGRAM WEEKEND TEST" FOR ONLY $35! !